Choose your favorite rider, slap on some gear, and match up against the world's best. Follow the real 25th PBR Premier Series season and compete in all 27 events, spanning across the US, ending at the PBR World Finals in Las Vegas. Campaign Mode uses real PBR event scoring to see how you stack up against the competition in events, and in the season standings. Match up against a friend in local-multiplayer Versus Mode. One player controls the rider, while the other controls the bull. Build up complex Spur moves as the bull, while the rider attempts to match your moves and hang on 'til the buzzer. 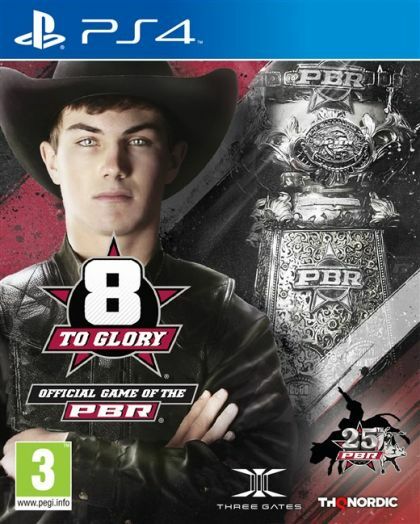 Play the Season: Follow the real 25th PBR Premier Series season and compete in all 27 events, spanning across the US, ending at the PBR World Finals in Las Vegas. Head-to-Head: Match up against a friend in local-multiplayer Versus Mode. One player controls the rider, while the other controls the bull. Boost to Win: 8 to Glory features an in-game Booster Pack system that rewards you with gear to outfit your rider and boost your stats. Rankest Bulls: Compete against the rankest bulls, or be the beast in Versus Mode and experience the ride from the other side. The Top Riders: Choose your favorite rider, slap on some gear, and match up against the world's best.